Alf Carter (on the right) with a group of hikers. Alf Carter has been hiking and rock climbing in Northwest Arkansas' Ozark Mountains for 25 years. He was among the first to rock climb many of today's popular sites in Northwest Arkansas. These include Sam's Throne, Red Rock Point and Busby Hollow to name a few. He was the second person to climb the Pedestal Rock area. You can feel confident hiking with Alf. His in-depth knowledge of the area and watersheds plus the years of experience in guiding hikers of varying skills and abilities will make your trip an enjoyable one. Alf Carter is a fully insured guide. 1972 - Manager of Ozark Outdoor Supply in Little Rock, Arkansas' first outdoor store. 1973 - Northwest Outward Bound - Eugene, Oregon. 28 day mountaineering course. 1974 - Founder of Ozark Mountain Sports, Northwest Arkansas' first outdoor store. 1974 - Bob Culp Climbing School - Boulder Colorado. 3 day rock climbing course. 1975 - Rainier Mountainering Seminar - Tacoma, Washington. 3 day technical mountaineering course. 1976 - International Alpine School - Eldorado Canyon, Colorado. 3 day technical rock climbing course. 1977 - International Alpine School - Eldorado Canyon, Colorado. 3 day technical ice climbing course. 1978 - 2 week climbing expedition with Jeff Lowe to Denali National Park - Talketna, Alaska. 1976 - 1980 Taught rock climbing in Northwest, Arkansas. 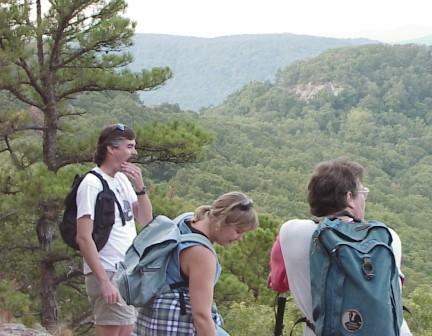 1980 - Today - Climbed and hiked in Northwest Arkansas. Explored many virtually unknown areas. Worked 3 years for Buffalo Outdoor Center. Currently owner/operator Azalea Falls Lodge & Ozark Wilderness Works. Jeff Lowe - many consider Jeff America's best all around mountaineer. He also founded and ran the International Alpine School and Lowe Alpine Systems. Lou Whitaker - founded Rainier Mountaineering School and led American expeditions to Everest and K2. Nuong Gombu - 1st man to climb Mount Everest twice. Mike Cooper - "Father" of Arkansas rock climbing. George Spencer - one of Arkansas' best all around outdoorsman. Taught rock climbing and climbed extensively out west.